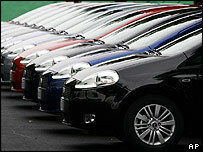 Executives at European car makers are tearing their hair out. Their efforts to clean up their act and reduce the amount of harmful emissions from the cars they produce seem to have come to nought. Instead, "the European auto sector could be the first casualty of increased climate change concerns", according to Lehman Brothers analyst Christopher Will. This is a paradox, Mr Will observes, since the European car sector "is responsible for no more than 1.5% of global carbon dioxide (CO2) emission - half that of the US auto industry and two thirds of Asia-Pacific". "Of the three markets, unit CO2 emission per car sold is lowest - by some margin - in Europe," Mr Will points out in a report, The Business of Climate Change. This is in part because "the European industry has invested more than its peers in technology to increase efficiency". In other words: those who make cars in Europe, for the European markets, have done more to make them cleaner than their counterparts in America or the Far East. Such behaviour by Europe's car makers could be seen as a rational response to both consumer demand and environmental regulation. The European Commission is expected to order EU car manufacturers to make sure the cars they produce in the future emit much less CO2. And greater awareness among drivers here means more people are more likely to chose cars that pollute less. "The European electorate is more 'green' than counterparts elsewhere," according to Mr Will, though he adds that "depressingly, this appears not be accompanied by any great hunger for the facts". Consequently, the European car industry is set to suffer from falling sales and profits while its American and Asian counterparts will probably escape relatively unscathed. Mr Will expects the European backlash to materialise "within a two to three year investment timescale". Or rather, shares in European car makers could start sliding pretty much right away, a risk that appears more pronounced for companies that specialise in making powerful cars. "Most exposed are BMW, Porsche and DaimlerChrysler," according to Citigroup analyst John Lawson, and of the three "it is impossible to ignore the fact that BMW is a carbon outlier in Europe, comfortably the worst of the major groups, and one with the least progress in the last eight years". "Under most conditions we expect that a headwind to BMW from the re-focussing of the consumer on fuel economy is likely," Mr Lawson says in a report CO2 - A New Auto Investor Issue for 2007. There is no value judgement behind the way analysts write about these issues. They are not saying that BMW pollutes more than its rivals, but merely that the car maker's model range consists mainly of powerful cars, thus the brand's "average fuel economy improved by only 10% from 1997 to 2005, against a 17% improvement by Mercedes". BMW's competitors also offer powerful cars, though they are better prepared for an anticipated shift in consumer tastes away from so-called "gas-guzzlers". Take arch-rival Mercedes, which according to Mr Lawson was "the worst of the major European makers from a fuel economy vantage". Mercedes' share price is nevertheless likely to suffer less of a hit as drivers desert thirsty motors, Citigroup predicts. Because it offers a greater range of "small and micro cars" and because it has "the highest diesel content in the upscale group". Interestingly, Mr Lawson does not bundle Porsche into the same category as BMW. Whereas BMW is expected to suffer as customers switch away from their thirsty cars, Porsche drivers might well prove more loyal. "Any estimate of the order of magnitude of carbon concern impacts on Porsche is extremely tentative," Mr Lawson says. The logic seems to be that drivers of Porsche sports cars simply do not care. 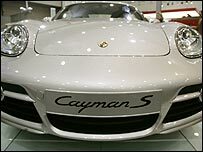 And with regards to an anticipated backlash against sports utility vehicles in Europe, Porsche has little to fear since "much of the recent strength of the Cayenne has been in Asia, where we would see limited carbon sensitivity", according to Mr Lawson's report. In BMW's defence, there are hints it is waking up to smell the coffee. Its latest Mini model emits 18% less carbon dioxide than its predecessor, thanks to what Mr Will describes as its "industry-leading direct petrol injection engine" which he sees as "an indicator of the real progress the industry is making". And its small 1-series helps pull down the average emissions from its BMW brand. In fact, BMW's poor performance in terms of average emissions is a result of its strategy to target the market for luxury cars, which is typically dominated by big and powerful vehicles. In America, luxury car drivers have been charmed by BMW's ability to deliver plenty of oomph, hence in that market it had "worse fuel consumption in 2005... than in 1997", according to Citigroup. In Europe, meanwhile, fuel economy improved during that same period - which makes it clear that BMW is able to deliver clean technology when the customer - or regulation - demands it. "Despite its formidable technological prowess, and the outstanding specific fuel economy of some of its engines, in a nutshell it has prospered by selling powerful, sporting vehicles to Europe's affluent buyers," Mr Lawson points out. So in the near term, producers of smaller, more fuel efficient cars may well be the winners in Europe's competitive car markets. Take Fiat, which according to Mr Lawson "shows decisively how a small-car mix, and the willingness to make a light environmental footprint, positions the company to benefit from growing consumer and legislator concerns surrounding carbon emissions". Renault is another car maker that is "already skewed towards smaller, lighter vehicles", observes Mr Will. Mr Lawson talks about PSA Peugeot Citroen's "well positioned.... mix and technology perspective". While Volkswagen Group's broad model line-up insulates it from any "significant net gains or losses" from anticipated changes. But it would be churlish to write off the likes of BMW and Mercedes just yet. If demand is changing the way the investment bankers predict, there is every chance that they too will reposition themselves and produce more small cars to satisfy European consumers and law makers. Only, do not expect Porsche to race down that same route anytime soon.